"Folk Routes New Routes" started a series of concerts by Shirley and Davy at London's Mercury Theatre and Cecil Sharp House During 1963/64. The concerts were packed, exciting events; the audiences aware of the unique chemistry at work and responsive to the feeling that barriers were being cheerfully demolished - between traditional and experiment; between East and West; between Folksong, Blues and Jazz; and between Old and New Magic. When it first appeared, the record received rather puzzled reviews. But it was to herald the movement in British Music, which included Pentangle, The Incredible String Band, airport and Steeleye Spain; all followed the route signposted by this brief collaboration. In 1975 - eleven years after the album's first release, Karl Dallas wrote, in his notes to "The Electric Muse", "It was there, at an instant, that Electric Folk, Folk Rock, call it what you will, was born." Since then, the record has continued to increase in stature, transcending its value as a landmark because of the quality of performance the two artists inspired in each other. Shirley has never sounded so bewitched, pure and otherworldly; no Davy so fluid, muscular and confident. Righteous Records is please to bring to a whole new generation the chance to hear two unique artists - who have both achieved separate worldwide reputations - at their early best. · Technical note: Whilst delving into the murky depths of Decca's tape vaults, an interesting fact came to light. The original recording of this album was in stereo, although it was only - as far as I can discover - issued in mono. So - a plus for Righteous Records - this is the first time that "Folk Routes, New Routes" can be heard in stereo. 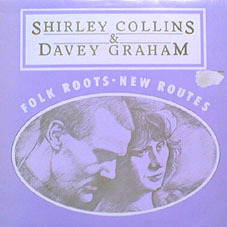 This pairing of one of British folk's finest voices (Shirley Collins) with one of the country's finest acoustic guitarists (Davey Graham) had a notable influence on the U.K. folk scene, although it eluded wide acclaim at the time. Collins' rich, melancholy vocals were most likely an influence on Sandy Denny, Maddy Prior, and Jacqui McShee. Graham helped redefine the nature of folk accompaniment with his imaginative, rhythmic backing, which drew from jazz, blues, and a bit of Middle Eastern music as well as mainline British Isles folk. Performed with tasteful restraint and selected with imaginative eclecticism, it also includes an instrumental showcase for Graham in "Rif Mountain," which acts as evidence of his clear influence on guitarists such as Bert Jansch and John Renbourn, and the acoustic style of Jimmy Page.